Rheumatoid arthritis is a long-term (chronic) inflammatory disease, which causes pain and inflammation in our joints. The ends of the bone inside joints are protected from wear and tear by healthy cartilage, a hard, shiny plastic-like material. Healthy cartilage is important as it keeps joints moving smoothly, and also helps muscles, tendons and ligaments do their jobs. Cartilage is also protected by synovial fluid that “oils” it and keeps it healthy. The joint is surrounded by a capsule with a thin smooth lining (the synovium) that keeps the fluid in place. 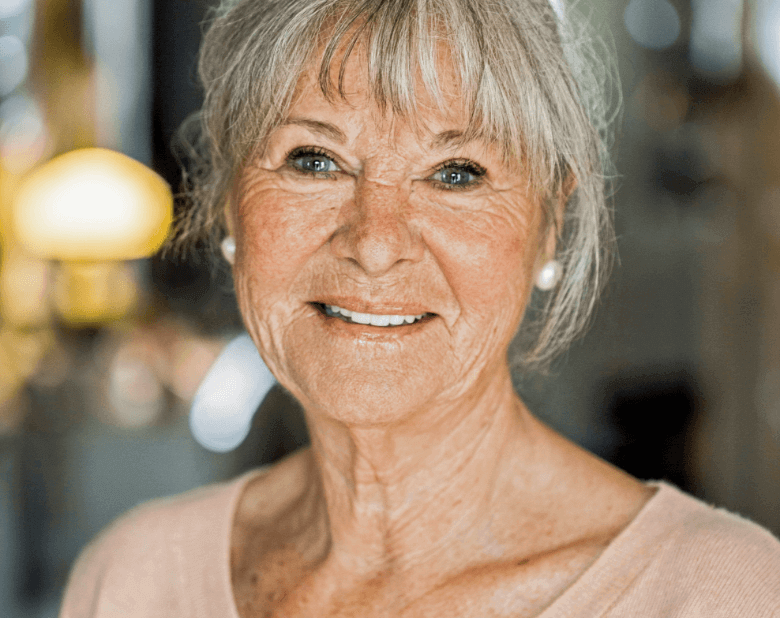 In rheumatoid arthritis, the joint lining becomes inflamed and thickened, and synovial fluid may build up inside the capsule, which adds to the swelling. 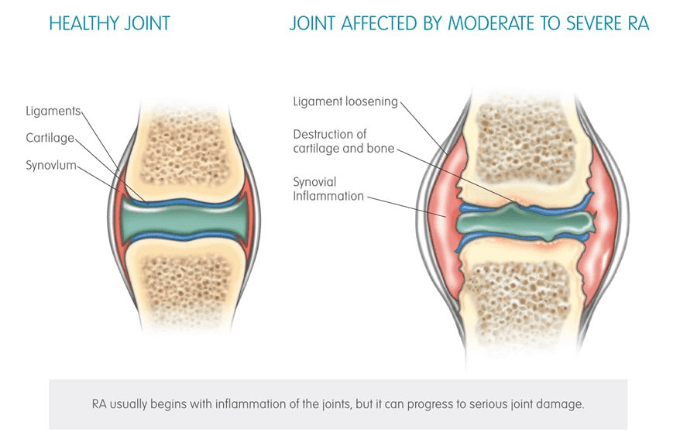 The inflamed joint lining may produce chemicals that damage the bone and cartilage in the joint. This inflammation of the joints can be painful, and sometimes disabling. In extreme cases, rheumatoid arthritis can move through the body and target other places as well, such as the eyes, the lungs and the blood vessels. The risk of heart attack and stroke may be increased if the inflammation is not well controlled. 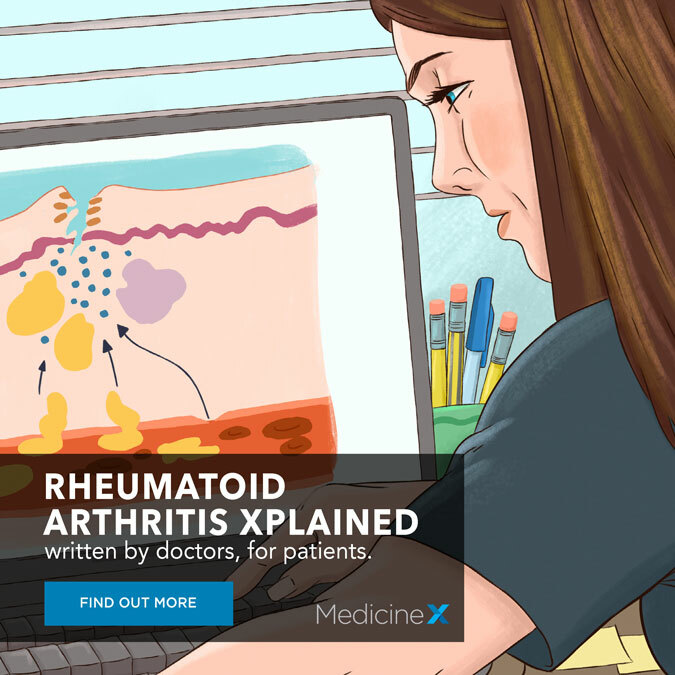 Rheumatoid arthritis is an auto-immune disease. In an auto-immune disease the body mistakes its own tissues for foreign or abnormal tissue and sends in the attack cells that cause inflammation. This can continue indefinitely and become chronic (long-term) inflammation. We don’t yet know why this happens. Rheumatoid arthritis is a chronic disease, which means it may last a lifetime. With medical advances, good treatment options are available to help manage the condition. Approximately 40,000 New Zealanders have rheumatoid arthritis. That makes it the second most common form of arthritis. It affects 1-2% of New Zealanders. No one is sure why, but women are three times more likely than men to develop the condition. Signs and symptoms of rheumatoid arthritis can range from minor to severe which can be disabling and makes it hard to diagnose. It can develop slowly for one person and quickly for another. The most common symptoms are pain, swelling and stiffness of the joints. Other symptoms can include loss of appetite (with weight loss), muscle pain and mild fever. Some people can have times when they have few symptoms, and other times when symptoms are severe and painful. One in six people with rheumatoid arthritis will have the more serious type with joint deformity (where the joints change shape) and some degree of disability. This is the result of damage inside the joints and a change in how the bones of the joints line up. Ligaments and tendons, which help the joints to function, can be damaged as well. Small joints in the hands and feet are usually the first places where rheumatoid arthritis appears. Swelling may also affect larger joints like elbows, knees, shoulders and hips. Rheumatoid arthritis tends to be fairly symmetrical; this means that if it affects a joint on one side of the body, it usually affects the same joint on the other side. Most people with rheumatoid arthritis will need to be on continuous treatment to control symptoms and prevent joint damage. You might visit your doctor complaining of joint pain or stiffness and swelling in your joints. The symptoms may be worse after sleeping or rest. Rheumatoid arthritis is a systemic condition, which means it’s active through the whole body. Because of this, its symptoms can also be felt through the whole body. It can feel like having the flu – or just feeling generally unwell. Fatigue, or tiredness, is also a common symptom. Non-steroidal anti-inflammatory drugs – or NSAIDs for short – can help to reduce the pain and stiffness associated with inflammation. They are usually taken after food to reduce the likelihood of an upset stomach. There are some people who shouldn’t take NSAIDs so you should check with your doctor or pharmacist before taking them. Paracetamol may be taken alongside NSAIDs, but some over-the-counter pain relievers, ibuprofen for example, are NSAIDs and these should not be combined with other NSAIDs. Stronger pain relievers such as codeine and tramadol are rarely used for treating rheumatoid arthritis because of their side effects. The most commonly used example is prednisone. These drugs suppress the immune system and shut down the inflammatory process. Steroids are generally used to bring the disease under control while waiting for other treatments to take effect. Steroids are usually used as short courses because of the risk of side effects from long-term use. DMARDs including methotrexate, sulfasalazine and leflunomide can reduce the symptoms of inflammation, and can slow down disease progression and risk of damage in the long term. They are particularly effective if they are prescribed early on, usually within 12 weeks of your symptoms appearing. Biologic medicines are used when other medications have been tried but severe symptoms are still present. Medicines like Enbrel are made from human proteins that get right to the source of the problem. Enbrel catches on to and inhibits another protein already in your body called tumour necrosis factor (TNF), which is a naturally occurring chemical messenger in your bloodstream. Too much TNF often plays a part in causing the painful swelling and redness around your joints in rheumatological conditions. Enbrel works by blocking the effects of too much TNF, which means that it cannot start the process that leads to inflammation. Surgery may be needed when pain is severe or when deformities are disabling. For example, deformed bones in the feet may make it painful and difficult to walk. Sometimes other joint structures such as tendons will need to be repaired. Exercise can strengthen your joints and keep them flexible. Your physiotherapist will be able to recommend suitable exercises. An occupational therapist can show you ways of doing tasks that will keep you independent. Joint pain and tiredness can be reduced by using items for protecting joints – like splints, slings and so on. An occupational therapist can also train you to do your everyday tasks in new ways that help protect your joints. Some people find meditation, aromatherapy, diet change, acupuncture and other natural therapies helpful in relieving their symptoms and improving their wellbeing. These treatments are generally safe when done alongside conventional treatments, but you should discuss this with your doctor. There is no proven evidence that they change the long-term outcome of the disease so it is usually best to combine these with medical treatments. If you smoke, you are two to three times more likely to develop rheumatoid arthritis than a non-smoker. Smoking contributes to osteoporosis (thinning of the bones), which may make joint damage worse. Smoking also makes it harder for rheumatoid arthritis treatments to work. It’s true that rheumatoid arthritis can’t be cured. But that doesn’t mean you can’t get on with your life. Arthritis New Zealand has helped thousands of people do just that. If you need further assistance with Enbrel administration, contact your healthcare professional, or call 0800 ENBREL (0800 362 735).